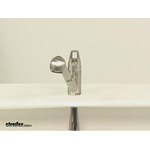 We currently have a couple undermount sinks options, one double and one single. 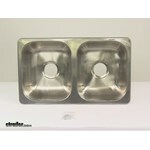 For a double option, we have the Patrick Distribution Offset Double Bowl Stainless Steel RV Kitchen Sink # 277-000077. I have included a review video of this one for you. 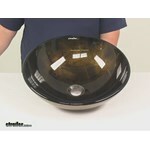 We also have a single bowl option in the Patrick Distribution Single Bowl Stainless Steel RV Kitchen Sink # 277-000202. The depth of the Patrick Distribution Offset Double Bowl Stainless Steel RV Kitchen Sink # 277-000090 that you referenced is 7-3/4 inches. 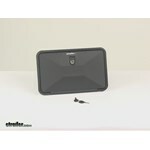 I attached a picture that has all of the dimensions for you to check out as well. I also attached an install video for the sink as well. We have this sink in stock so I went to our warehouse to measure it for you. The quoted dimensions for Patrick Distribution Single Bowl Stainless Steel RV Kitchen Sink # 277-000075, 23 x 17-3/4-inches, include the mounting flange. 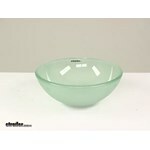 Just the bowl portion of the sink measures approximately 20-1/2 x 15-inches. The sink includes a template for new installations. The width of the undrilled mounting flange is approximately 1-inch all around the perimeter. The Patrick Distribution Single Bowl Stainless Steel RV Kitchen Sink # 277-000075 is an undermount installation and comes with clips which you install underneath your counter. 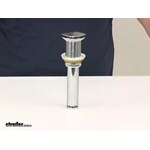 The sink then secures with the screws or wingnuts and you will also want to use sealant such as # 0160297 for a water tight seal to finish the installation. Can The Patrick Distribution Offset Double Bowl Stainless Steel Sink Be Top Mounted? 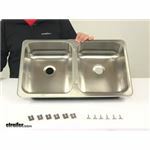 The Patrick Distribution Offset Double Bowl Stainless Steel RV Kitchen Sink # 277-000090 can be used as a drop in. The flange is not beveled, so you will have a flat edge. 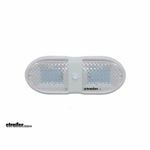 For the undermount, it will fit into a cut out that is 24-3/4 inches by 15-5/8 inches, so it will need to be only slightly larger than that to use as a drop in. You will want to make sure you seal it well with silicone caulk if installing in this manner so you don't have a leak with such a small but strong flange. 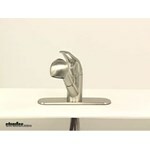 Our range of RV sinks, both stainless-steel kitchen sinks and bathroom sinks, is displayed on the linked page. 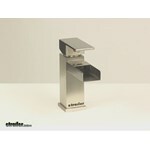 We have both single and double sinks, such as # 277-000075 and # 277-000127, and these come in many sizes. You can click on the linked page to choose the features you prefer, such as design and color. 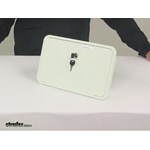 We do have quite a few sink covers available for your RV kitchen. We have both plastic like # LC306198 and wooden styles like # CAM43431. If you wanted to provide me with the measurements of your sink, I would be more than happy to help you pick one out that will suit your needs. I have linked all the sink covers to this page for your convenience. 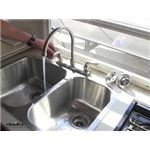 For your 2005 Coleman Pop-up camper, I recommend the Single Handle RV Kitchen Faucet with Pull Down Spout - Brushed Nickel # 277-000101. This faucet has the 3 hole mounting. 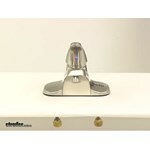 For a single hole mount, I recommend the Single Handle RV Kitchen Faucet with Pull Down Sprayer - Brushed Nickel # PF231461. 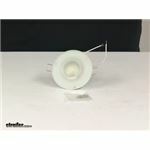 If you need a drain, I recommend the Valterra Sink Drain with Strainer Basket # A01-2011VP that fits 1-1/2 inch p-traps or has a 3/8 inch barbed drain adapter. 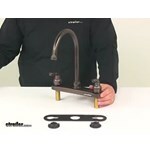 Yes, the Faucet part # 277-000094 would replace the faucet that your 2016 Forest River Rpod 180. 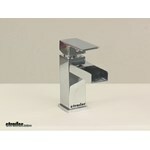 This faucet is made to the industry standard specs that would be the same as what your trailer has. 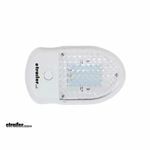 The Optronics LED RV Interior Light with Switch - 18 Diode - Surface Mount - White Housing # RVILL34 and the Patrick Distribution 18-LED Surface Mount Dome Style Light Fixture - 12V # 277-000114. 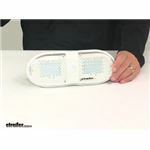 There is not a lumen rating on the slimmer light from Patrick Distribution, but both have received reviews from customers for the functionality and bright light that both put out. 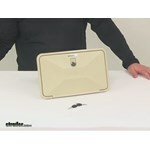 I believe you will be very happy with the slimmer light you prefer. I've attached videos to help. There are not replacement parts available for the Dual Handle RV Kitchen Faucet - Oil Rubbed Bronze # 277-000095. Based on design, the normal replacement parts you find at your local hardware store will work with this faucet should it need rebuilding at some point. 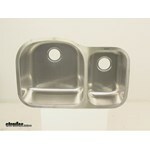 The Double Bowl Sink # 277-000127 measures 25 inches x 15 inches overall. 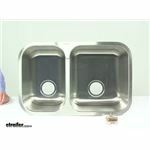 Both sink bowls measures 10-3/4 inches x 13-1/8 inches. I've attached a diagram showing these measurements for you. You are correct that this sink does not have cut-outs for the faucet or handles. For this sink, the faucet and handles would install through the countertop rather than the sink. 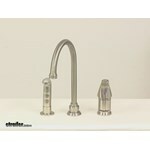 The Side Lever RV Kitchen Faucet with Pull Down Spout - Brushed Nickel # 277-000129 can be installed as you show in your photo, you will simply need to make sure you use a caulk sealant because you will be missing the rubber gasket this system utilizes when using the 3 hole installation. 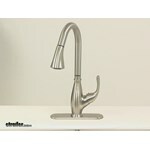 The overall height of faucet # 277-000129 is 17-3/4 inches. 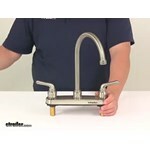 This measurement and more is shown in the video on this faucet which I have linked for you. 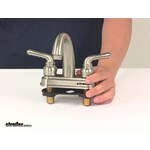 The Dual Handle RV Bathroom Faucet - Brushed Nickel # 277-000087 measures 6-1/4" wide at its base, 6-3/8" tall, with handles that measure 4" apart center-to-center and a tube inlet with a 1/2" male NPSM connection. 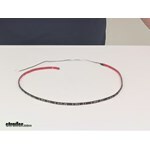 I've added a photo for you as well which shows these dimensions. The part # 277-000114 that you referenced can only turn on both lights or turn off both lights. They can not be activated independently. 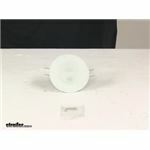 You may instead be interested in the LED Dome Light part # 277-000340. 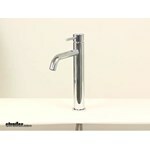 For your 2013 Flagstaff High Wall, we have many kitchen faucets available like the Side Lever RV Kitchen Faucet with Pull Down Spout - Brushed Nickel # 277-000129 that have the removable spout you mentioned. 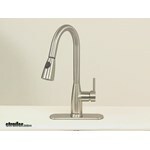 This is a pull down style but we also have pull out styles like the Ultra Faucets Single Handle RV Kitchen Faucet with Pull Down Spout - Brushed Nickel # 277-000182. 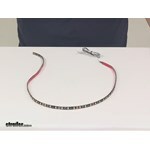 I have linked the pages to all your options to assist with style and color options. I went out into our warehouse to measure the Side Lever RV Kitchen Faucet with Pull Down Spout - Brushed Nickel # 277-000130 for you. From the top of the curve to the sink it is 18-1/2 inches. I've attached a photo to help. 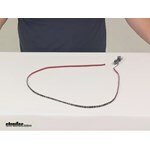 Basically you use install the Marine 2-Position Battery Switch # 277-000403 by cutting the wire for the circuit you want to install it on and wire one end of the wiring to either post underneath the switch. When the switch is "on" the circuit is completed and when it's "off" the circuit is deactivated. I attached a picture that shows the underneath side of the switch with the posts visible. 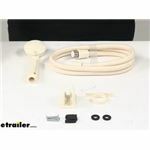 The Dual Handle RV Kitchen Faucet - Brushed Nickel # 277-000094 does not have the replacement o rings and cartridges available. The similar Phoenix Faucets 8" Dual Handle RV Kitchen Faucet - Brushed Nickel Finish # PF231402 does have the replacement cartridge and o rings # PF187026.